Ice­Warp inte­grates all com­mu­ni­ca­tion & col­lab­o­ra­tion fea­tures into one uni­fied solu­tion. Between 2011 and 2012 I designed this set of icons. Please also see the set of user inter­face ele­ments I cre­at­ed for the project. 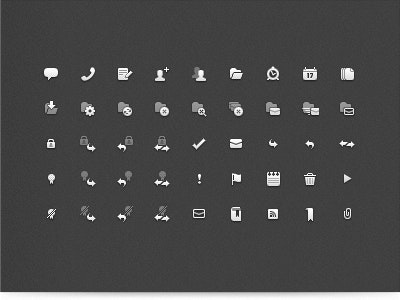 We decid­ed to use grayscale icons only, and I was glad for that. It would be overkill to cre­ate the full-col­or set of all the need­ed assets. 16px icons. Yes, we didn’t have reti­na res­o­lu­tion at that time, so 16px was per­fect­ly fine. Here are a few new icons for the Ice­Warp, e-mail client.